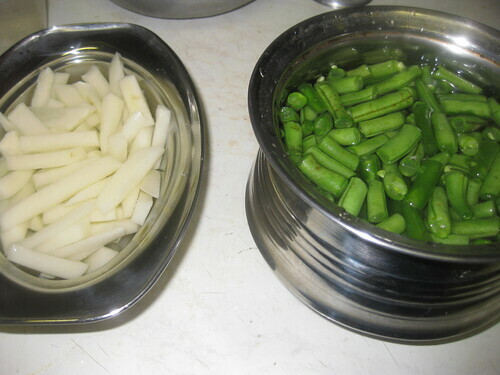 Wash and chop the beans into inch long pieces.Peel and chop potatoes lengthwise into fry sized wedges.Rinse and set to drain. 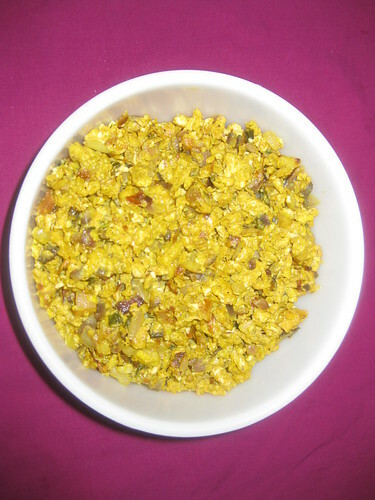 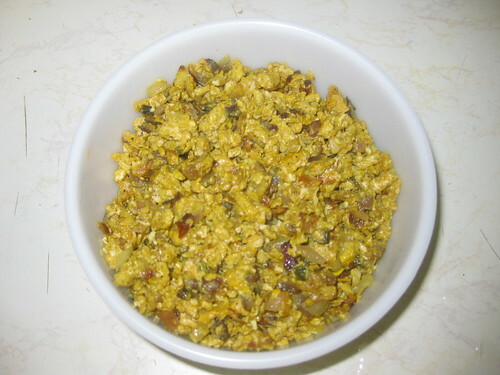 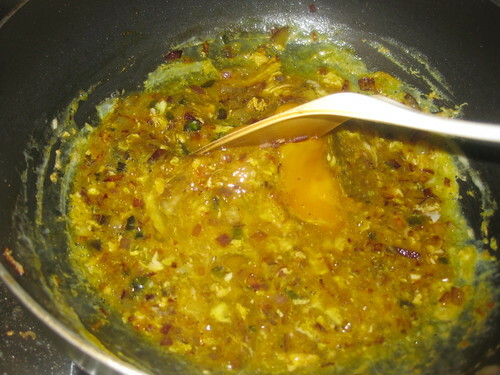 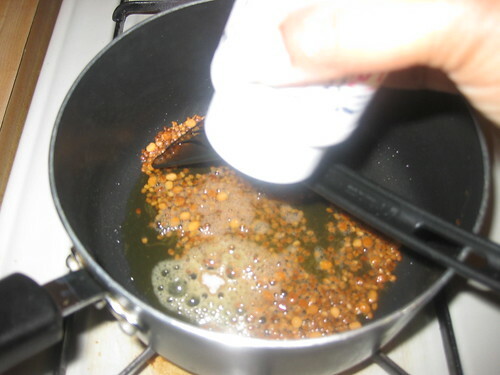 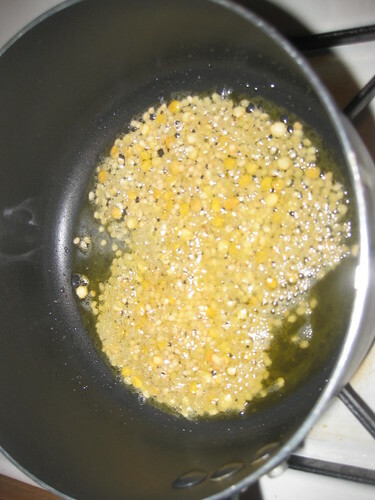 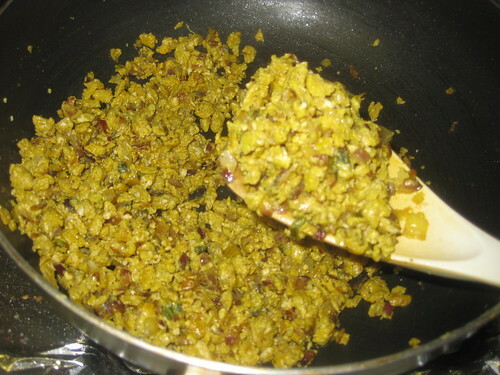 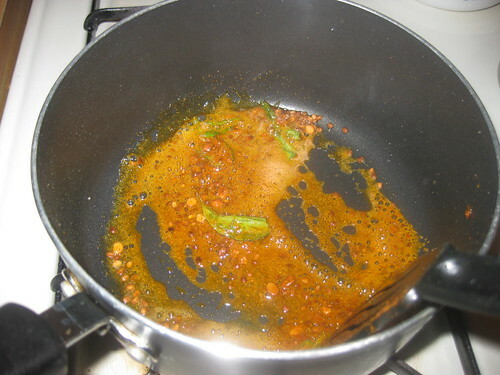 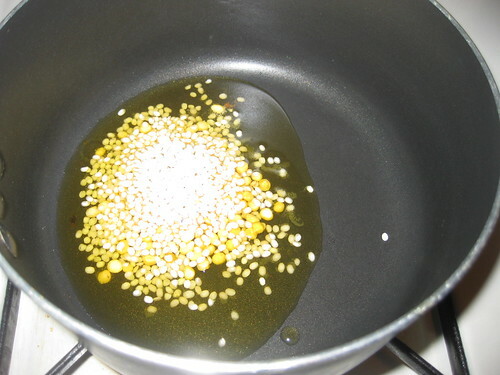 Heat oil in a cooking vessel,add mustard seeds and as they pop up,ad cumin seeds,urad dal,red chillies,green chillies , curry leaves ,hing and turmeric powder and saute for few seconds. 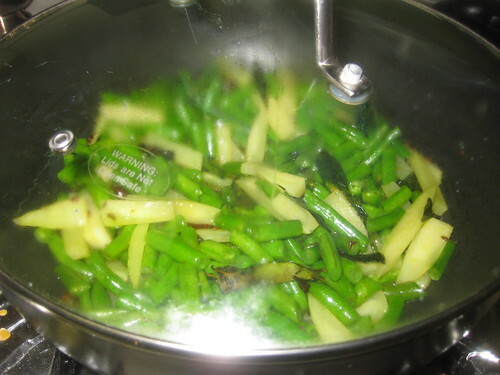 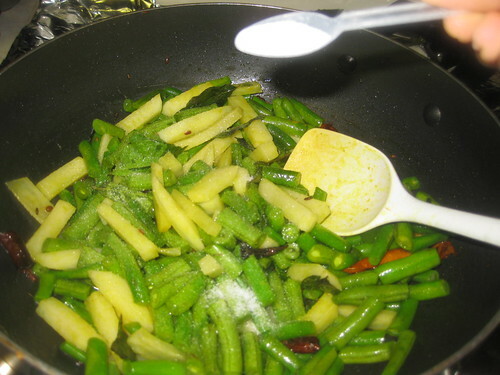 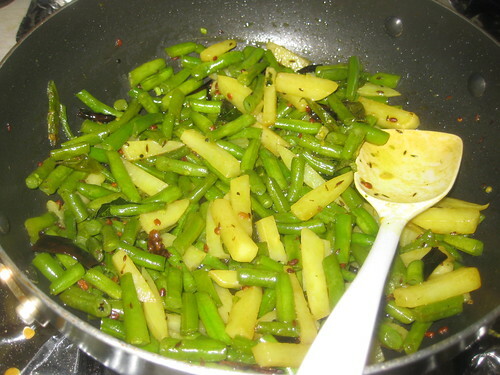 Now add beans and potatoes and salt.Combine,place lid and simmer for 15 mts or till the potatoes and beans are three-fourth cooked.Check often and stir if needed so that the vegetable is not burnt.Remove the lid. 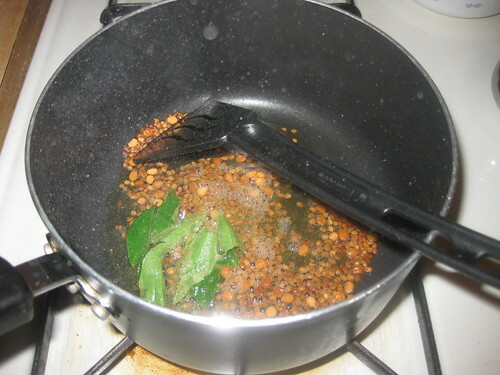 Now add red chilli powder,coriander powder,cumin powder to it and combine well. 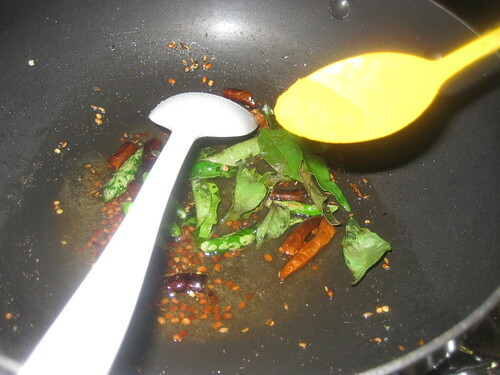 Stir fry without lid on high flame for a 10 mts and combine well.Turn of the heat . 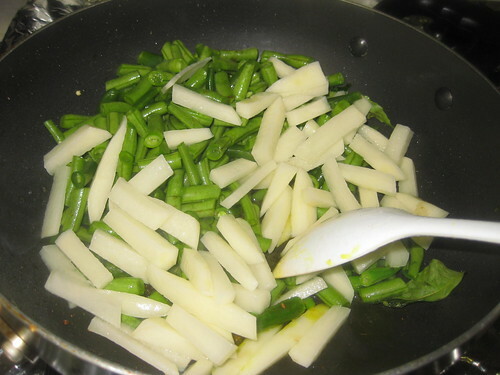 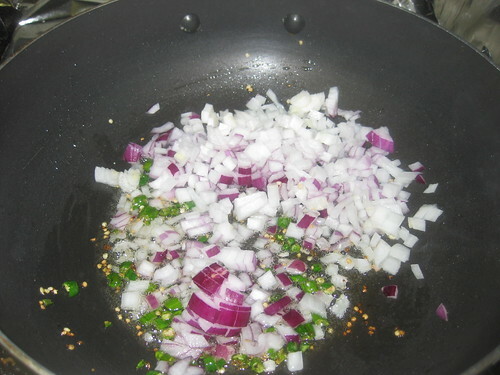 Finely chop onions and green chillies . 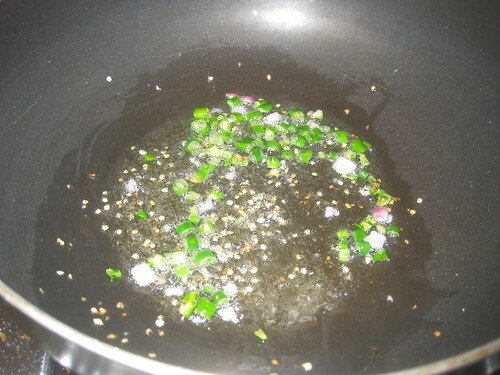 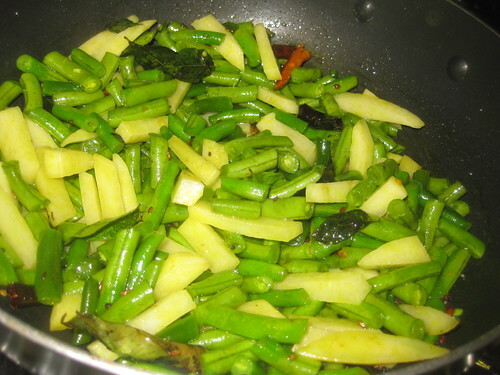 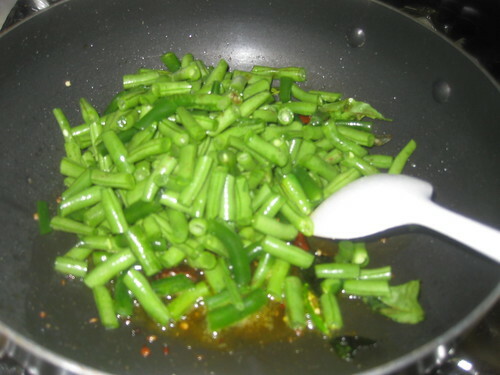 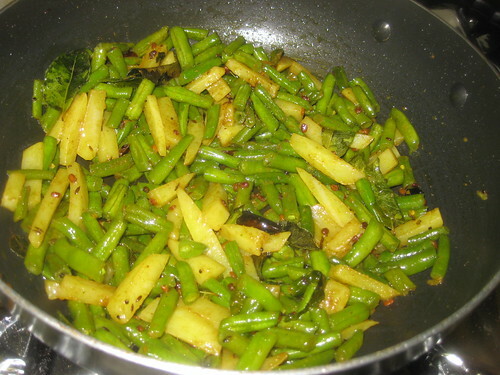 Heat oil in a pan,when its hot add green chillies let them fry for 2 minutes.Now add chopped onions fry until they soft and transparent. 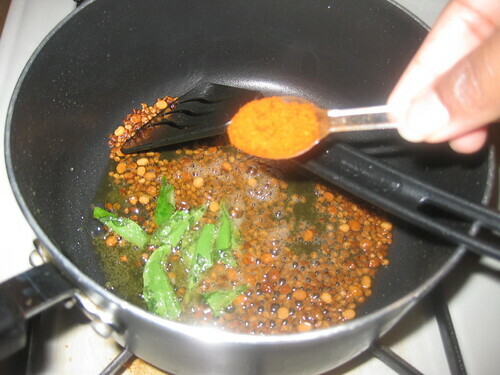 Now add pepper powder,turmeric powder and salt mix well. 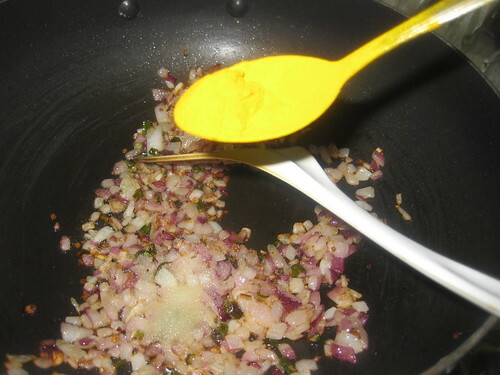 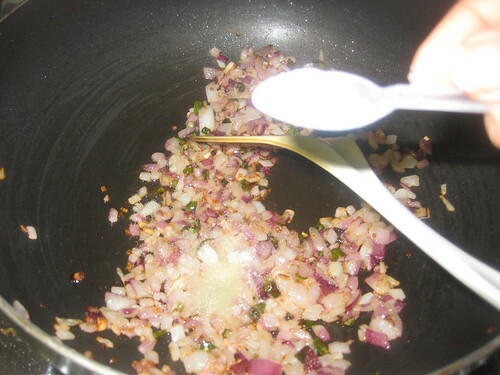 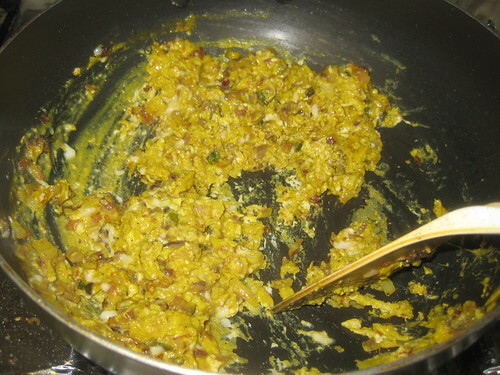 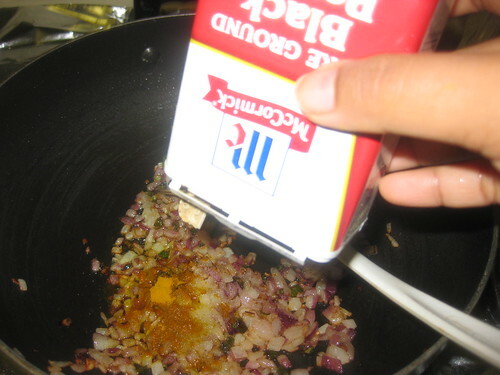 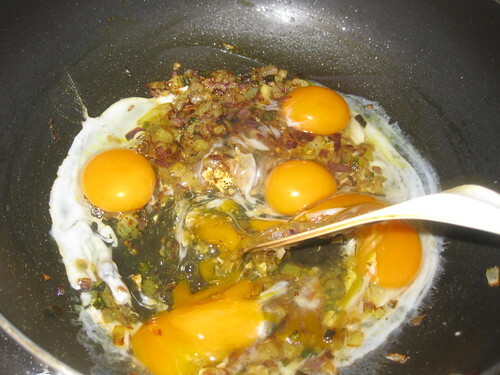 Now break the egg and add to it onions.Mix eggs and onion stirring constantly with a spatula till they starts forming into small clumps or even before.Cook till its well cooked. 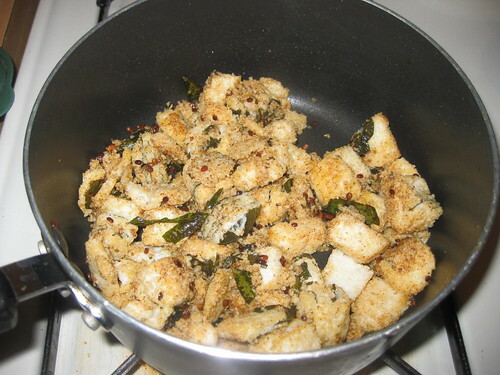 Remove from heat,Garnish with coriander leaves..
First cut into pieces idli roll or shredded . 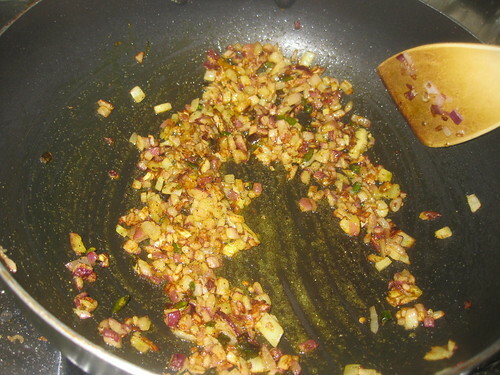 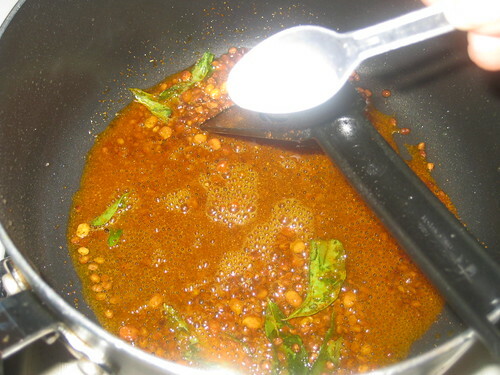 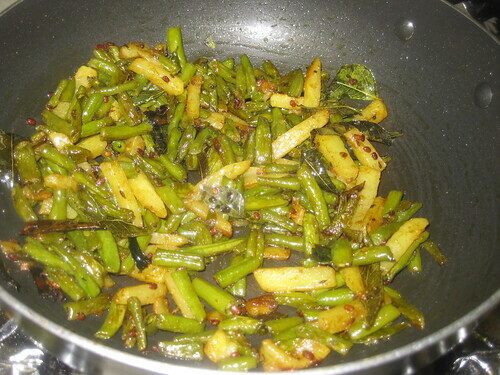 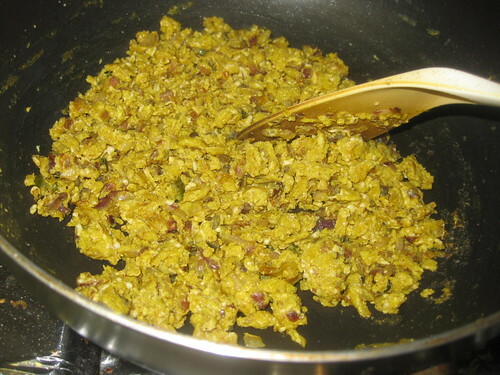 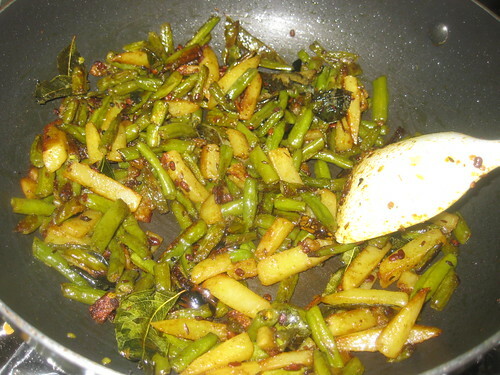 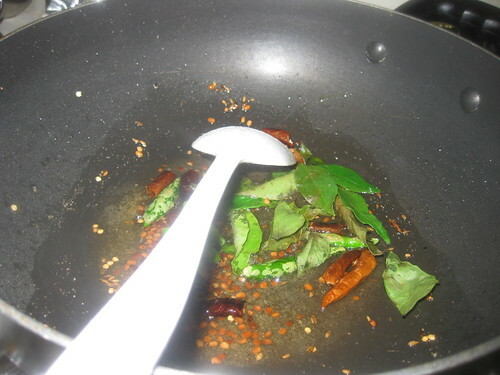 Heat oil 2 tsp oil in a pan,add urad dal,channa dal fry for 2 minutes,when its change the color,add hing and curry leaves. 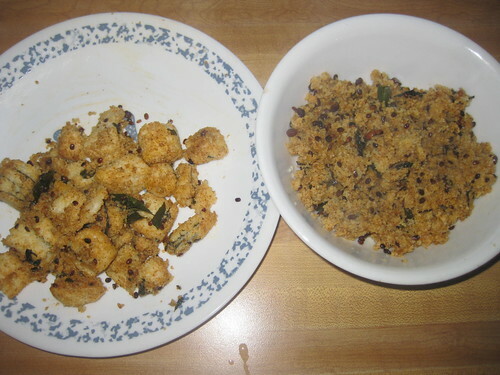 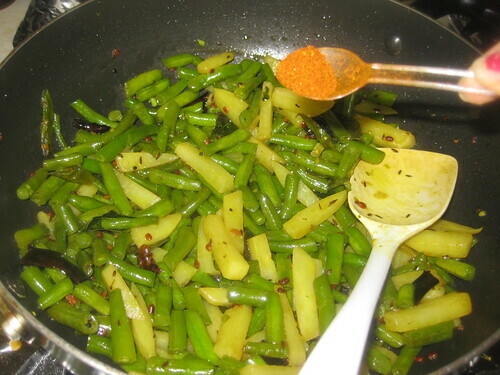 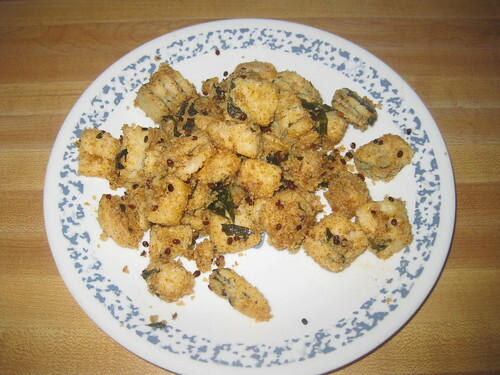 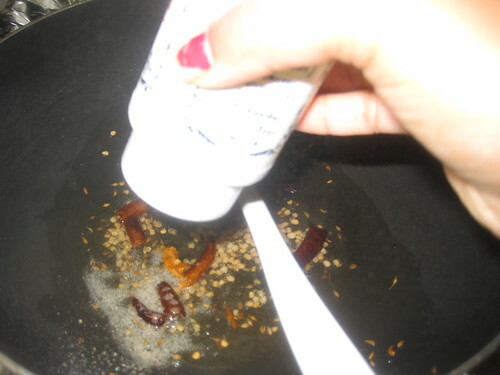 Now add idli pieces and salt to it mix till coated well the spices .Fry for two minutes. 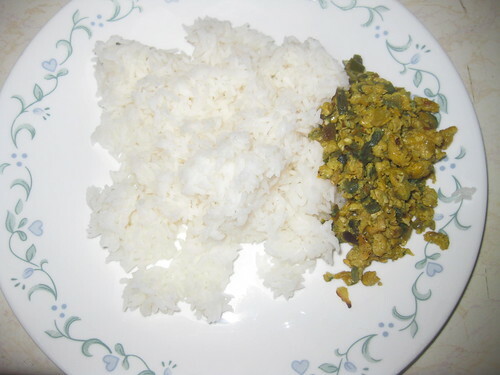 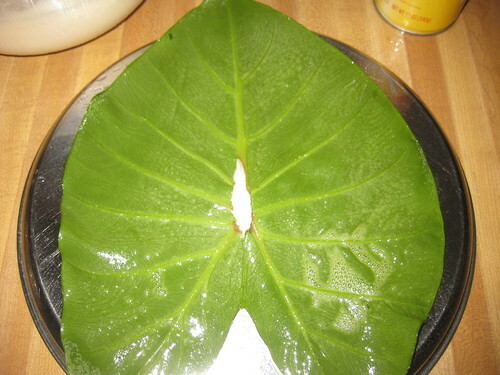 Wash and clean the arbi leaves.Trim the thick central veins. 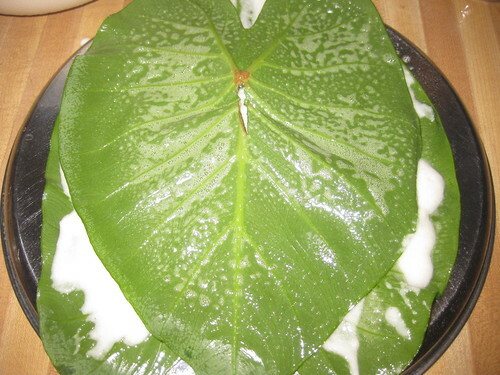 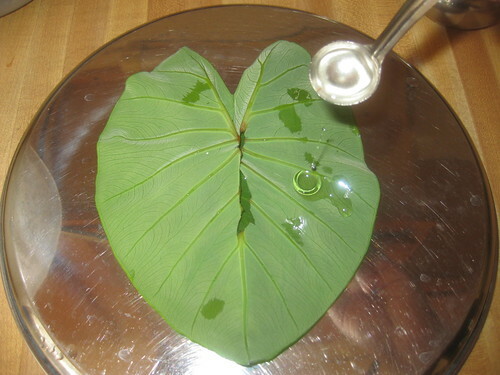 Place largest leaf on flat surface, place leaves upside down and apply oil on it. 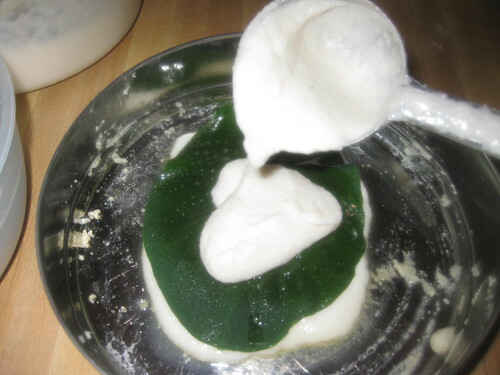 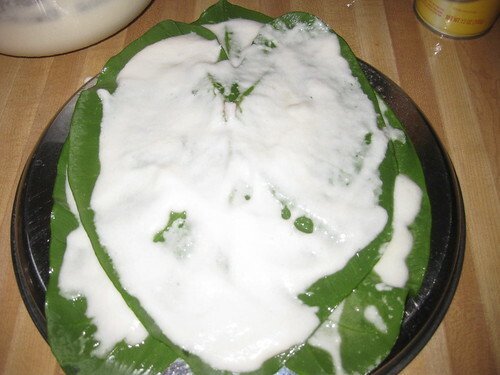 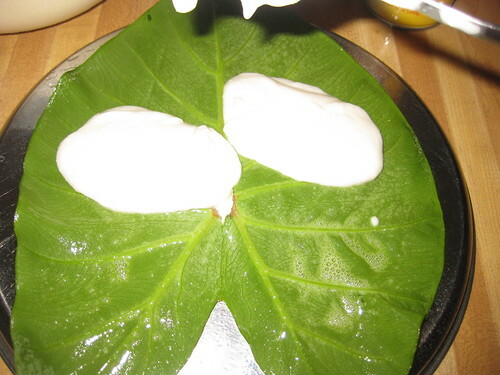 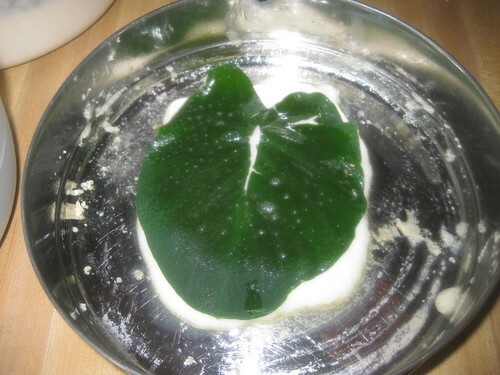 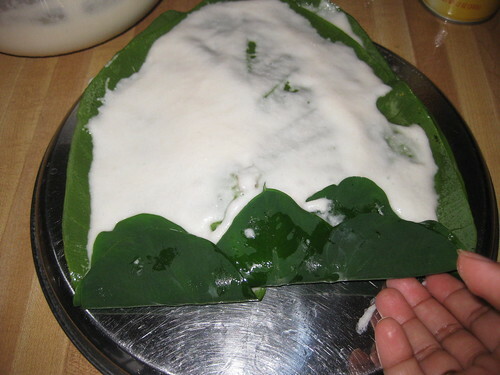 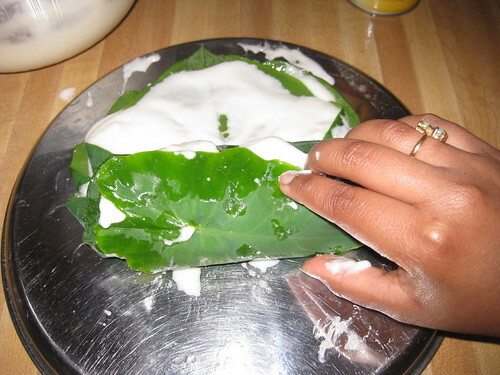 Apply some idli batter spread the batter on the leaf. 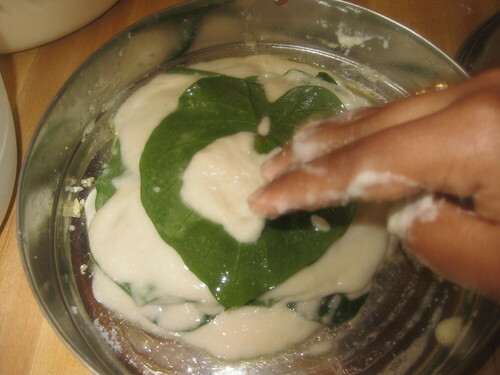 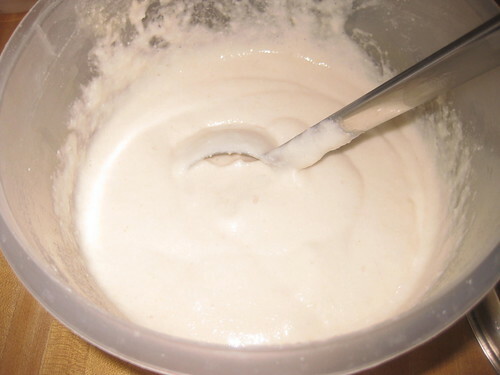 Keep adding leaves and spreading the mixture until you have around 5 to 6 leaves depending on the size.The idea is to use as many leaves as possible. 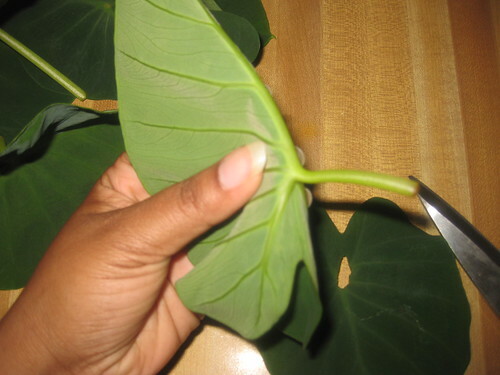 When the second leaves are added on the lower set place them upside down(see the above photo and the one blow.It helps to roll he leaves with ease.When u 5 to 6 leaves add. 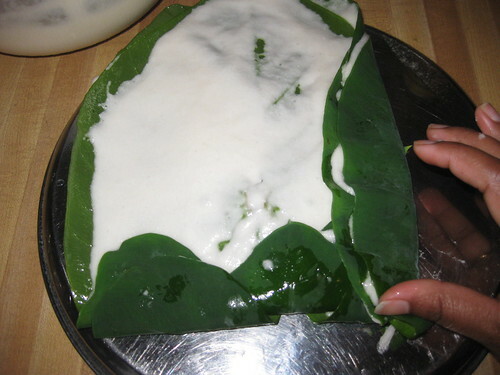 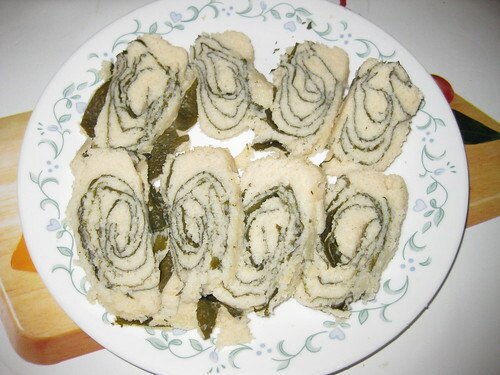 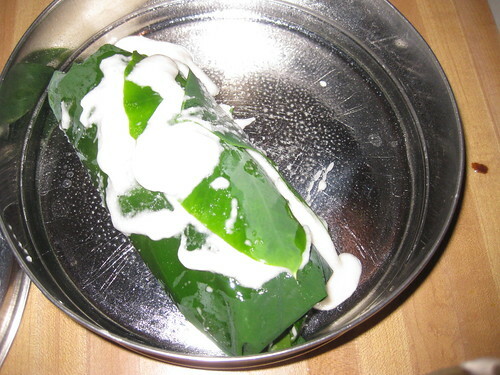 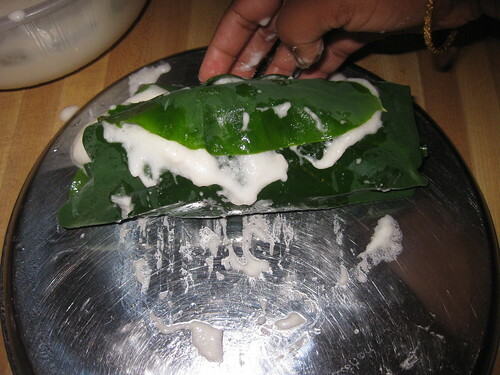 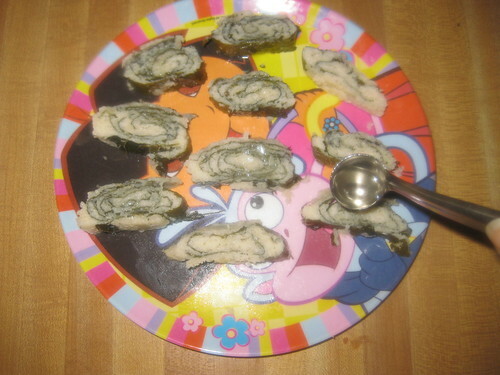 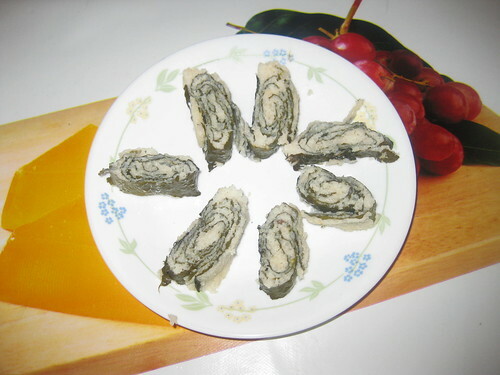 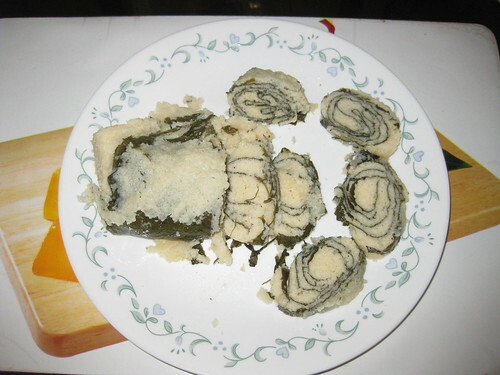 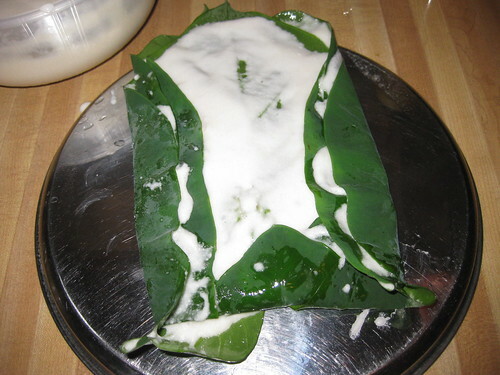 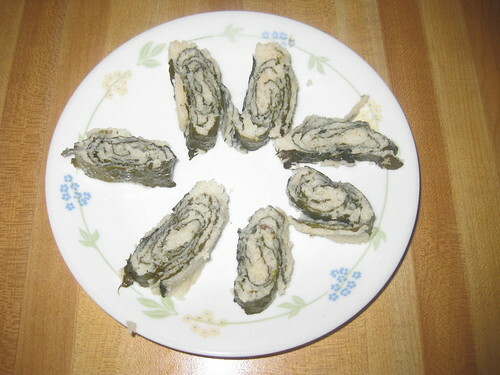 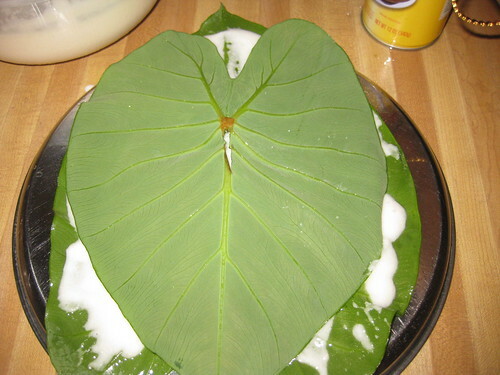 When the batter has been spread on the leaves it is time to roll the leaves.First roll the sides towards the center. 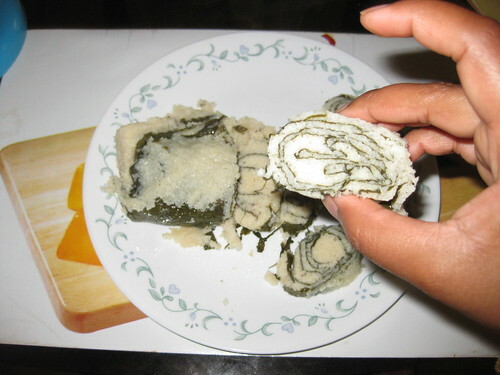 Then roll it from bottom to top. 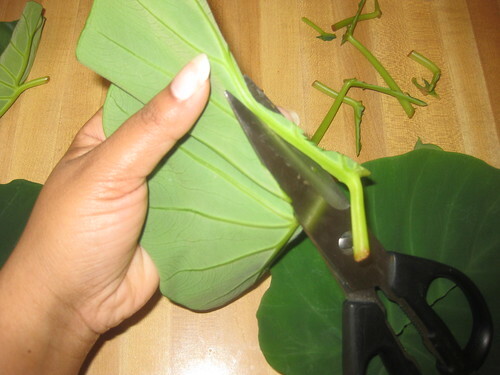 Repeat this procedure for reaming leaves. 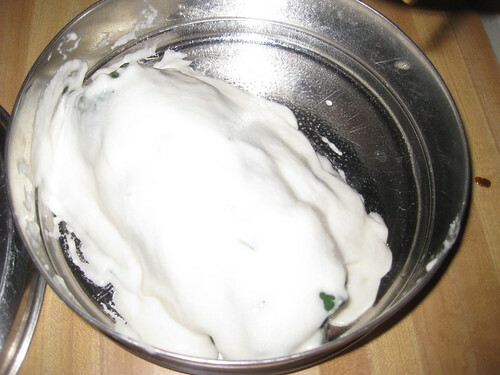 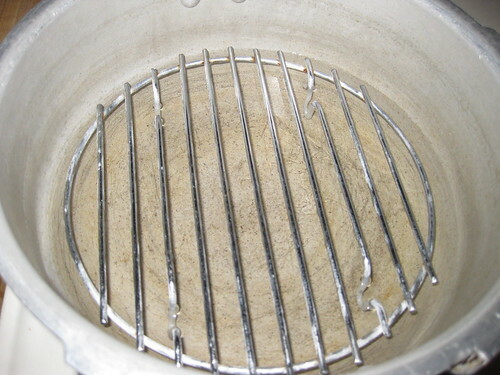 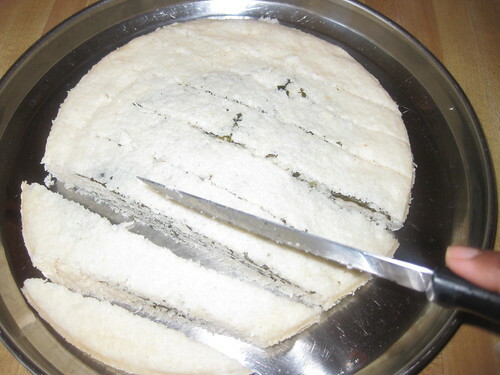 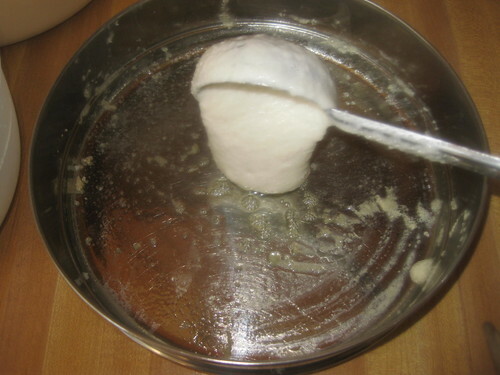 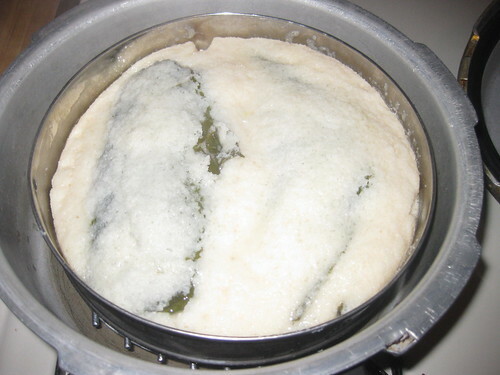 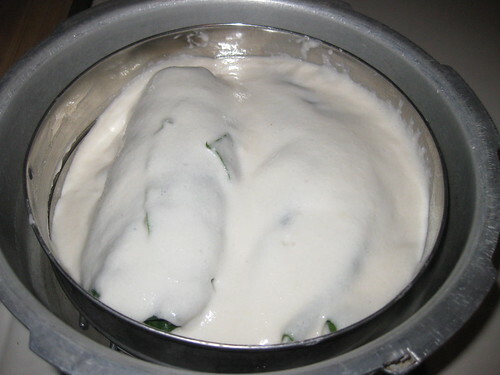 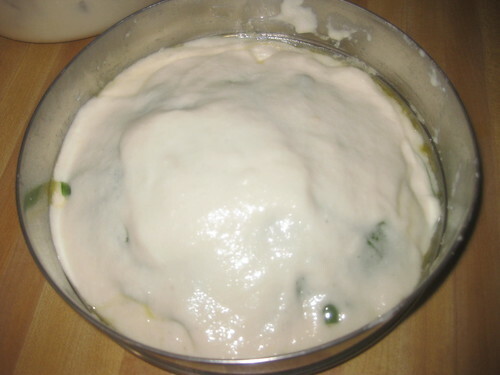 Place the idli roll in a steamer on to add some idli batter. 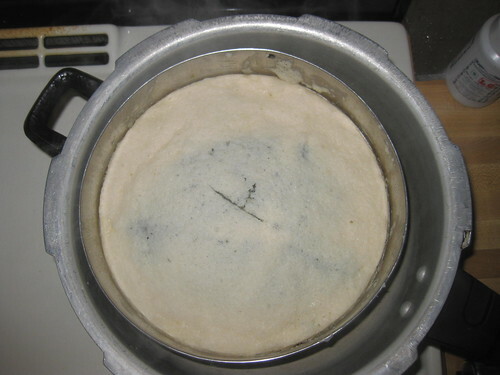 In the meantime ,pressure cooker with 1 to 11/2 cup inches of water.Bring it to boil. 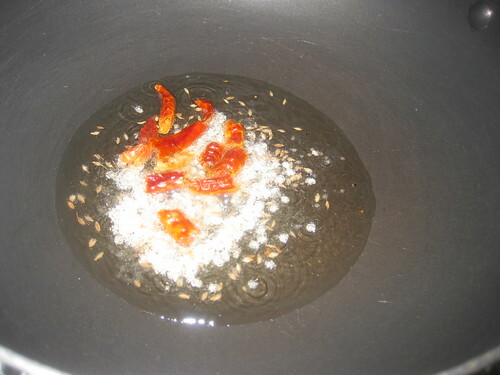 Once the water comes to a boil,In a pressure cooker without using the weigh. 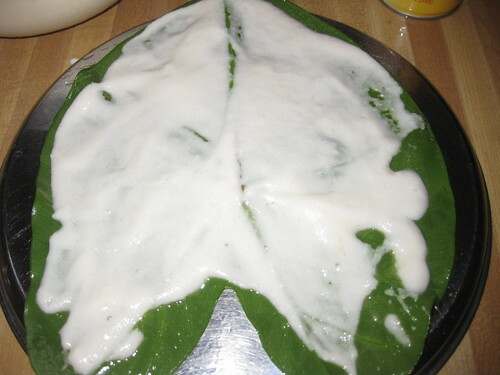 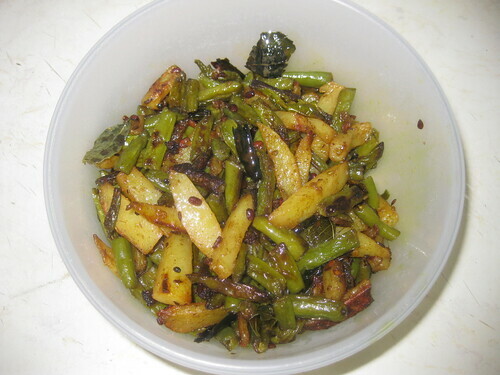 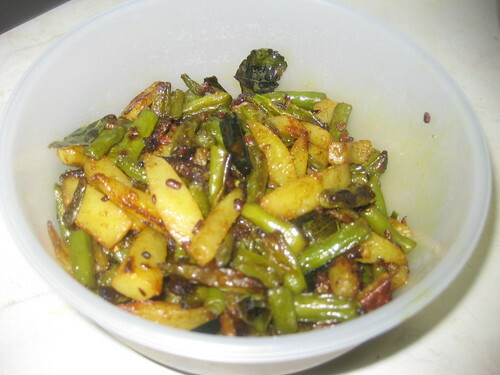 Steam it for around 25 to 30 minutes till is well cooked.Remove the arbi leafs idli rolls from steamer. 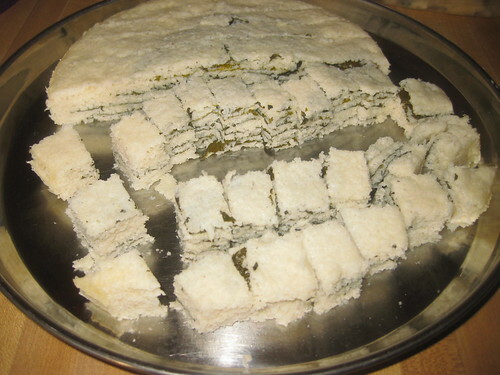 Cut these idli rolls into small pieces.Add some oil or ghee on top. 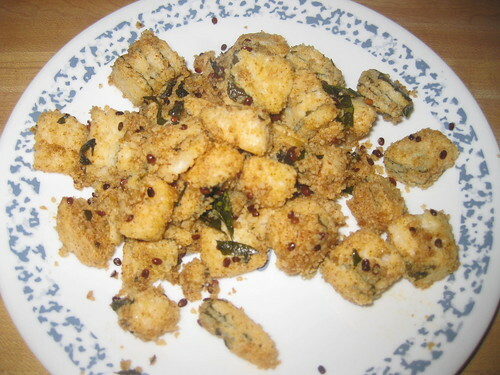 You can eat this various ways.You can spread tempering on these pieces or you can shallow fry like (idli upma),or make bajji . 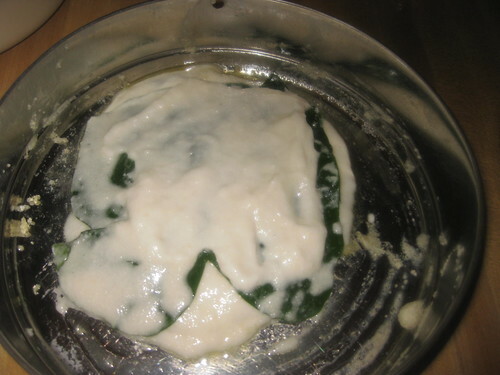 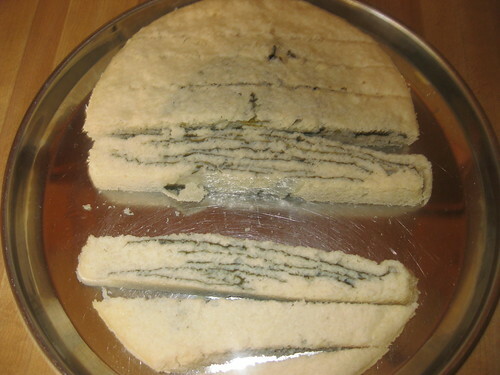 Take a plate like (dhokla Plate) grease with oil .Pour some idli batter and place the leave apply the oil ,again add some bater and place the leaves,repeat the process . 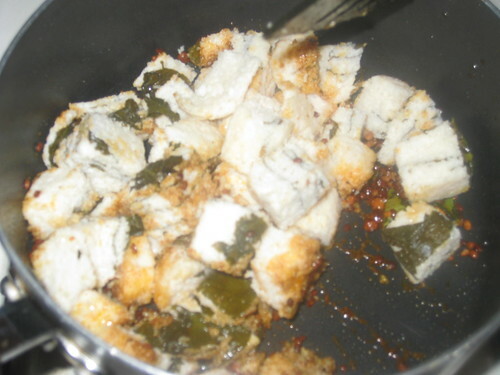 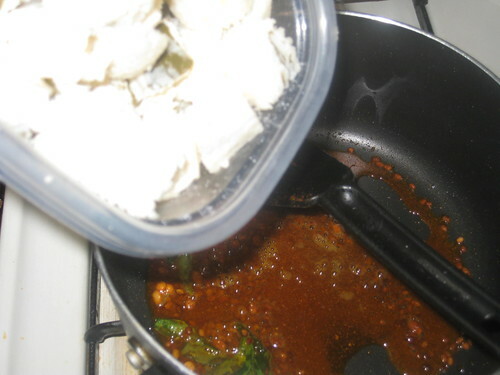 when leaves are done on top add some idli batter.Cook it for 25 to 30 minutes in cooker.